the wide river. A bird called out from a large oak behind me. The sky was clear, and I could just feel a touch of fall in the air. I loved this—Friday morning, and no one else in sight on the river. 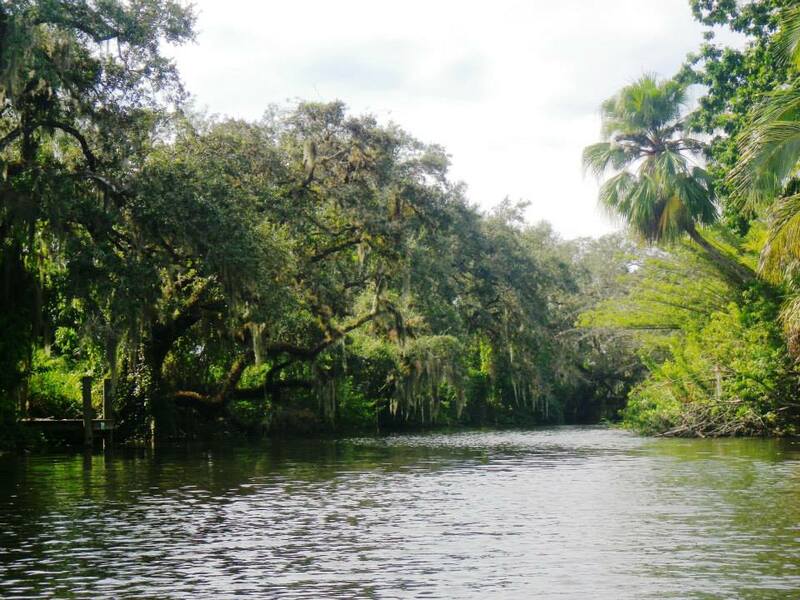 Named for the Calusa Tribe that inhabited the area (500 to 1700 A.D.) and traveled the river long ago, Caloosahatchee means, “river of the Calusa.” At that time, this much shallower river originated from sawgrass meadows west of Lake Okeechobee, and the Calusas traveled it in dugout cypress canoes. (How cool is that!) 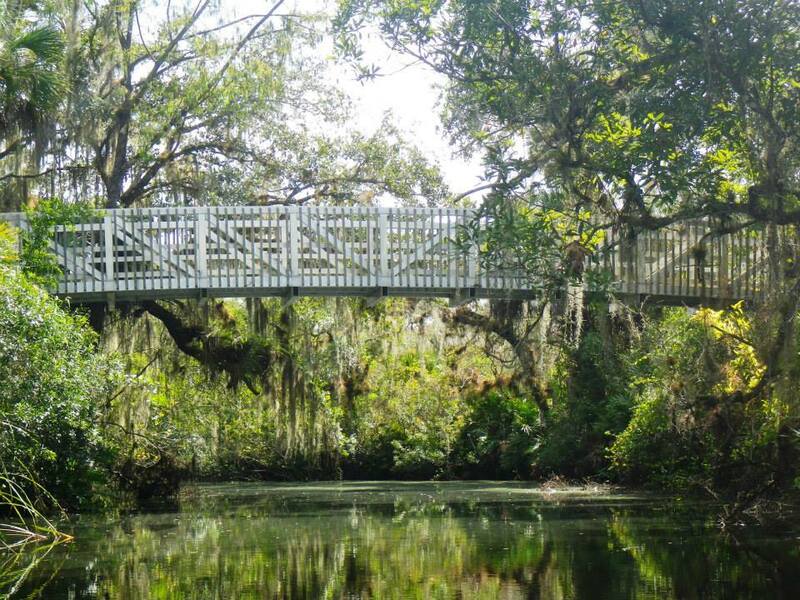 However, the Disston Canal was constructed in the 1880s, connecting it to the lake, and then dredging began in order to straighten and deepen the river. Today, this river (C-43 Canal) runs about 76 miles from Lake Okeechobee to the San Carlos Bay. (Boning) Of course, we are well aware of the issues with the water quality this fall due to the discharge of fresh water from Lake Okeechobee! I paddled west toward my destination, Hickey’s Creek, briefly wondering who Hickey was. I admired the tall pines, palmetto palms, and oaks dripping with moss on the north side of the river. On the south side, homes, often with comfy wrap-around porches, sat on spacious properties. Parts of the banks had been kept wild with tall grasses and leather ferns. I passed two oxbows, leftovers from the original winding river, and took the curved route to the left of the tiny islands. Forty-five minutes into my westward paddle, I made a left before the house with the windmill and entered Hickey’s Creek—a much narrower and more shaded waterway—and part of the State-designated paddling trail. An hour later, I reached the Hickey Creek Mitigation Park and stopped for a stretch. When I continued my paddle into the park area, the homes disappeared, and the river narrowed. At times, I wasn’t certain I had taken the right path, and I longed for breadcrumbs or some other such marker to put down so I could find my way back! However, the paddle was quiet and serene, and the herons, limpkins, and egrets seemed to not be disturbed with my presence. Thirty minutes later, I turned around and headed back. The wind had picked up, and when I reached the Caloosahatchee, I had to put some muscle in my paddle. However, in less than an hour, I had reached my put in location. Susan, I really enjoy your blog! I have a question about the photo that runs across the very top of your blog page. It’s so beautiful. I imagine that it’s a cropped version from a larger photo? I would love to see that pic, if you have it. I’m asking because I sing with a nonprofit group called Angelica, and I am in search of an image for our upcoming concert’s publicity materials. Our concert title is “By the River: A Treasury of American Songs.” Would you be so kind as to give us permission to use your photo? (With the appropriate credit, of course.) I have to try a few images to see what might work w/ our text, etc, but yours is one of my faves! Please let me know. Thanks. Hi Kathleen. Thank you for your comments. I will certainly dig it out for you to consider; what a beautiful compliment! I have to remember the river first, but I will send it to the email address you have given me. I’m thinking Alafia or maybe Hillsborough…I’ll be in touch soon. By the way, I love the title of your concert! I will check out your website.